"I hope you find as much pleasure and wisdom in this read as I did. Total icon!" While I didn't grow up watching Fonda in films (although my mother has her work-out tapes), I first became interested in her after watching her interview on Amanda de Cadenet's online show, The Conversation. 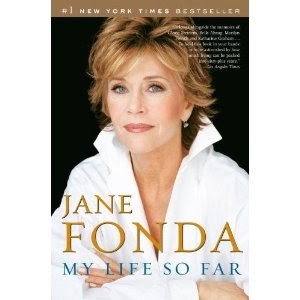 In The Conversation, Fonda talks about her third act, (the latter portion of her life) and how she connected back with her childhood self; her true self. While reading the memoir, I had no idea about her different marriages, her rough childhood, and famous actor father. She says, “In the process of writing this book I discovered there were clear, broad, even universal themes that ran through my life, a coherent arc to my journey that, if I could be truthful in the telling, might provide a road map for other women as they face the challenges of relationships, self-image, and forgiveness." I'd check it out if you're craving a real story from an inspirational woman. Now I'm just waiting to get to the part where she invents her own workout. Happy Weekend!